Web removing tool which extends to 14 feet long enabling the user to reach high places in order to clean away spider webs. This is a great tool and enhances any treatment being done around the home for spider control. 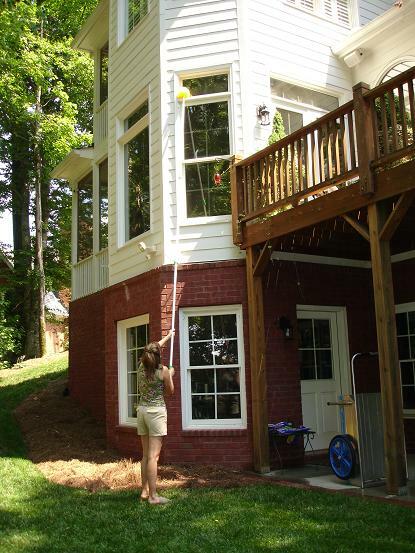 Of course, removing spider webs won’t remove the spiders but it certainly enhances the performance of all applications made as well as insuring no egg sacs are left behind. Remember, the egg sacs are pretty well protected from the insecticides and won’t die just because they are sprayed. If left alone they will eventually hatch and can produce hundreds of offspring. These young spiders will almost assuredly find their way into living areas and/or start nesting close to where they hatch. Most importantly, they may not hatch for several months following applications so there may be no chemical active to kill them when they finally are exposed and vulnerable. For this reason the removal of as many webs as you can find is always suggested. For comparison, you can see how much higher this Webster reaches compared to the 5-8 footer.